IN TWO SERIES. 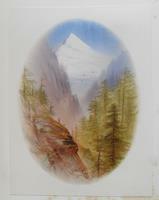 ALPINE SERIES. 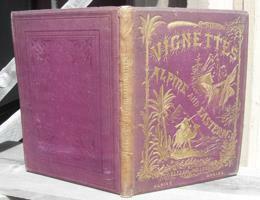 This is the first printing of the first edition of VIGNETTES: ALPINE AND EASTERN. IN TWO SERIES. 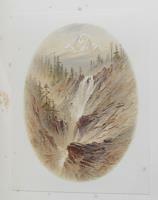 ALPINE SERIES by Elijah Walton & T. G. Bonney. 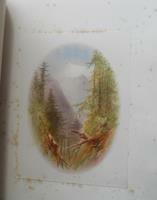 This book was published in London by W. M. Thompson in 1873. The book measures 335mm tall x 244mm, with collation: blank FFEP (all pages have blank versos) + title + preface + half title + list of views + 12 color plates with following three page sequence for each (blank guard sheet + plate sheet + descriptive text sheet) + page of ads for Walton’s other books (Flowers From The Upper Alps third edition, The Coast Of Norway second edition, Vignettes: Alpine And Eastern noted to be available at Xmas 1872 in one volume) + blank RFEP. CONDITION: Original maroon cloth boards, elaborate gilt stamped decoration and titles on front cover, five stamped borders rear cover with vine and leaf pattern in middle frame, TEG. Pages sewn at some early stage with new endpapers (old paper). No other restorations. 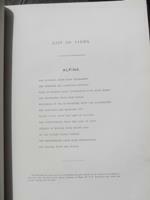 All examples of the book are either resewn or need sewing because the original publication was made with glued pages, and none of that glue remained stable and holding over the years (hence pages became loose). Some rubbing at tips corners and spine ends, some fading to the original spine cloth (often the spine on this book is completely replaced), solid binding, old gift inscription dated 1873 on the top of the title page, no other owner marks or writing on pages, foxing on the card mounts for the plates and on some of the plates themselves but not in the images on the plates, some foxing on text pages at the front and rear. The elaborate covers are cleaner and brighter than what is usually found for this book. Price: $1950.